In this paper we consider the analysis of an M/G/1 queue with working vacation. In contrast to the previous literature where the working vacation starts when all customers are served (exhaustive discipline) we consider the case where the vacation period starts when the customers present at the system at beginning of the service period are served (gated discipline). The analysis of the model with gated discipline requires a different approach than the one with exhaustive discipline. We present the probability-generating function of the number of customers in the system and the Laplace-Stieljes transform of the stationary waiting time. Keywords: queueing theory, vacation model, working vacation. Working vacation (WV) is an extension to the regular vacation model, where the server is switched off during the vacation. In WV systems, instead of completely stopping the service at the beginning of the vacation period, the server continues serving the customers with a different service rate. In practice the service rate during WV is lower than the one during service period, but it is not a modeling restriction. WV models are suitable to describe practical system features like the effect of a lower intensity administrative task of the server, e.g. a safeguard service, following an active period. In the multiple working vacation (MWV) model a vacation period is followed by another vacation period if the server finds the system empty upon returning from vacation. The regular vacation model is a special case of the working vacation model with zero service rate during vacation. Thus the working vacation model is a generalization of the regular vacation model and hence, as expected, its analytical complexity is somewhat higher than the one of the regular vacation model. Vacation models with Poisson arrivals have been intensively studied in the last decades. For such models and for their solution we refer to the survey of Doshi  and to the fundamental topic of Takagi . The WV policy has been introduced by Servi and Finn  in 2002. They applied the M/M/1 queue with multiple working vacations to model a Wavelength-Division Multiplexing (WDM) optical access network. They derived the probability-generating function (PGF) of the number of customers in the system. Baba  generalized this model to a renewal input GI/M/1 queue with working vacations and derived the number of customers at customer arrival epochs and at arbitrary time. Wu and Takagi  generalized the model of Servi and Finn to the M/G/1 queue with working vacations. They provided a numerical solution for computing the distribution of the number of customers in the system. Liu, Xu and Tian  proved that the well-known stochastic decomposition property of the vacation queues  holds also for an M/M/1 queue with working vacations. Recently Li and Tian with co-authors in  and  applied the matrix analytic approach subsequently to an M/G/1 queue with exponential working vacations and to its extension to batch arrivals, respectively. In all the above-mentioned working vacation queueing models the exhaustive discipline has been applied, i.e. the vacation starts, when the queue becomes empty. In this paper we analyze the M/G/1 queue with exponential working vacations, but in contrast to the above references we consider the gated discipline. According to this discipline only those customers are served during the actual service period, which are already present at the beginning of the service period. Thus the customers arriving during a service period are present at the beginning of the next vacation period. A potential application of this model is the analysis of an Internet Protocol (IP) over WDM optical access network (see in ). The contribution of this paper is the queueing theoretic analysis and the results for the M/G/1 working vacation queueing model with gated discipline. In the first part of the analysis we establish a functional equation for the PGF of the stationary number of customers at the end of vacation period, for which we utilize known results for the transient behavior of the M/G/1 queue. We solve this equation by using a convergence property of sequence of scalar probability functions (see  or ), which results in the expression of the PGF of the stationary number of customers at the end of vacation period. In the second part of the analysis we establish a relation for the PGF of the stationary number of customers at an arbitrary epoch. For the analysis we apply several elements of the methodology of . The main results are the expressions of the PGF of the stationary number of customers at an arbitrary epoch and of the Laplace-Stieljes transform (LST) of the stationary waiting time. The change of service rate is an important feature of the WV models. In the the WV model the service period ends in a service completion epoch. It means that the last customer served during the service period is served with the regular service time and the first one in the vacation period is served with the service time of the vacation period. In contrast to this the end of the vacation period is not synchronized with service completion. If a vacation period expires during the service of a customer the service period starts with repeating the complete service of the same customer but with the service time of the service period. The rest of this paper is organized as follows. In section 2 we introduce the model and the notation. The stationary number of customers at the end of vacation are derived in section 3. The PGF of the stationary number of customers is given in section 4. The LST of the stationary waiting time is provided in section 5. A.1 The arrival rate, the mean customer service time, the mean vacation time and the mean customer service time in the vacation period are positive and finite, i.e. A.2 The arrival process, the customer service times, the sequence of vacation periods and the customer service times in the vacation periods are mutually independent. A.3 The customers are served in First-In-First-Out (FIFO) order. The Markov Regenerative Process (MRP) framework (introduced in , Theorem 1) holds also for this model, since all the necessary assumptions are fulfilled. Thus the limiting distributions of the number of customers at different epochs and in different intervals are stationary distributions. Hence through this paper we use the term " stationary" instead of " limiting". In this section we derive the PGF of the stationary number of customers at the end of vacation period. We describe the evolution of the system over the vacation period in terms of PGFs of the stationary number of customers. For doing this we take the idea of utilizing the transient behavior of the M/G/1 queue from , which we recall first. The descriptions of the evolutions of the system over the vacation period and over the service period lead to a functional equation for the PGF of the stationary number of customers at the end of vacation, which we call the governing equation of the system. 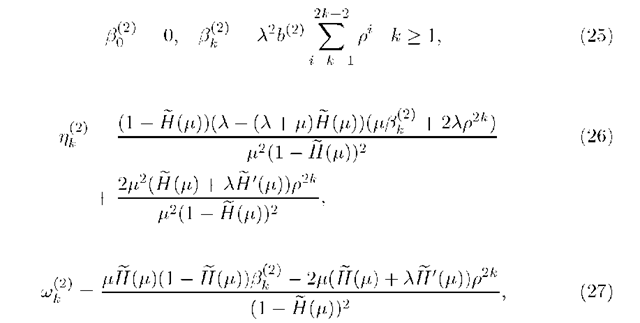 Afterwards we solve this functional equation by applying a convergence property of sequence of scalar functions. as its root with the smallest absolute value (). Let f = f(1) denote the mean of the stationary number of customers at the end of vacation. Similarly let m = m(1) denote the mean of the stationary number of customers at the start of vacation. Applying (3) and the definition of m(z) in (7) gives the statement of the theorem. This relation describes the f m transition under the gated discipline. Substituting (9) into (5) results in the governing equation of the system. and an empty product is 1. Substituting (21) into (20) gives the theorem. Remark can be also determined by applying (12) in the gated discipline specific transition (9). The computation of the second moments is more involved.